1) Malthus predicted the end of the world’s ability to feed itself in 1798. 2) In the 70’s, oil was projected to cost (in constant dollars) $200/bbl, whereas the current price is about $80, or after inflation, less than in 1980. 3) California was going to run out of salmon – it’s having abundant seasons. My classmate’s opinions were formed watching severe weather growing up in Florida, working in the oil industry, and, for the last 27 years, as a venture capitalist in Silicon Valley. He’s smart and thoughtful. He understands risk. How could our opinions on climate change be so opposed? Once again, the battle turns out to be filled with irony. What saved us from each of the predicted disasters was not that the predictions were wrong, but that we changed the set course through innovation, a skill through which my classmate makes his living. Had we stayed on the trajectory we were on without innovation, the alarmists would actually have been correct. Malthus raised the specter of mass starvation but failed to account for the response to his predictions — innovations in machinery and fertilizers — as well as the growth in the workforce. Recent scholars such as Ester Boserup augmented Malthus’ theory, adding that whenever the population threatens to exceed the food supply, people find ways to increase the production of food. The predictions were followed by visible evidence of food shortages, which drove innovation and altered Malthus’ trajectory. My classmate’s third example, salmon in California, experienced this same process. Environmentalists warned of impending doom; experience on the ground amid fishermen supported dire predictions. Salmon stock began dwindling in the 1950s then crashed in 2008. 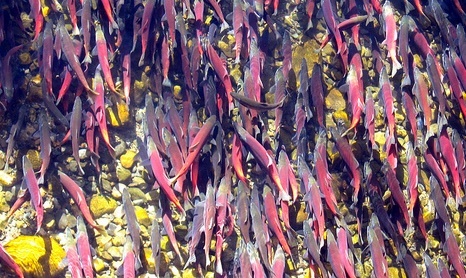 By 2011, only 1% of the salmon remained. Public pressure moved government and resource managers to take steps to restore both water and habitat for Chinook salmon, “innovating” California’s hatchery and conservation programs. The salmon population rebounded. Innovation altered the course of my classmate’s alarmist scenarios, and it’s exciting to see how innovators are beginning to alter the course of climate change as well. Entrepreneur Elon Musk with his Tesla electric car, solar and battery initiatives is one example; successful airline executive Richard Branson, founder of Virgin Atlantic Airways, is investing in renewable energy projects for his jet fuel and his Caribbean venture. Innovators, businesses, governments and public opinion come together to create adaptations that will shift a trend away from disaster. As described in an excellent New York Times op-ed piece by Robert Jay Lifton, this shift or “swerve” is a “major historical change in consciousness that is neither predictable nor orderly.” Lifton compares the climate change swerve that’s happening now to the nuclear swerve that shifted us during the Reagan era from a nuclear build-up to the non-proliferation treaty of 1986. The questions my classmate posed are important to address. Just as we need competitors to create industries and innovation, we need “rationalists,” as my classmate believes himself to be, to keep us “alarmists” engaged. Photo courtesy of jcookfisher via Flickr cc.